I'm going to be a senior in college soon (have I mentioned that? 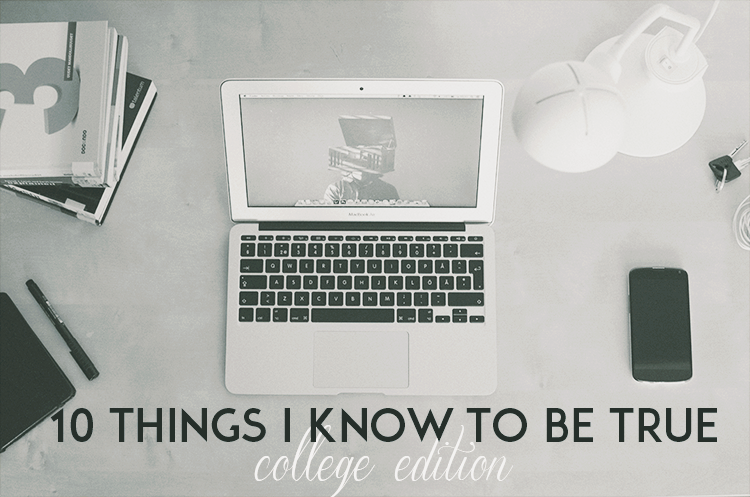 Oh yeah, I have...10 million times), so I thought I'd drop some wisdom on you with 10 things I know to be true about college life. There's way more than 10 things I know to be true - trust me - but these are the first 10 that popped in my head. Maybe I'll expand in a separate post in the future, but for now this one's for you future and currently returning collegiates! Pack an umbrella: Take it from a girl who, after she moved up to college Freshman year, spent 99% of the first week drenched because it rained the entire time. An umbrella is one of those pesky things that evaded my perennial packing check list. It took me almost a month to invest in an umbrella. So now, I make sure to keep one at home and one in the car. Also, pack an extra set of sheets and extension cords (other commonly glossed over items)! There aren't enough command strips in the word: However many you think you'll need? Double that! It may seem excessive and expensive, but I promise it's worth it to invest in lots of command strips. You'll use more than you think, plus any leftovers can be used to fix mid-semester breakdowns of current strips or be used next year! Get done early on Fridays if you can: Each and every semester I try to make magic happen as I tweak my upcoming class schedule. The magic? Trying to make Fridays a half day or less! I've sacrificed my share of early morning or late evening classes just to have glorious Friday be a short day. I promise it's worth it in the long run. Since you'll usually be going home Fridays for breaks, the earlier you're done the better. Who wants to be stuck in class at 4pm on a Friday? Not this gal! Cheers to early weekending! Don't schedule a class earlier than 9:30 for Friday: On another note relating to the above, don't even think about scheduling a class earlier than 9:30 for a Friday. You'll regret it a million times over and that early morning Friday class will be your most missed, guaranteed. If you haven't heard, Thursdays are the new Fridays in college. Adjust your schedules according so you'll have some time to recover from the previous night no matter what you were up to. Don't be afraid to keep asking until you get an answer: Just because you think someone in a position of authority is the end all be all to answering a question or trying to accomplish something academically, doesn't mean they really are. Sometimes when it comes to scheduling, overrides, and exceptions it takes a village or finding just the right person in a department to get a task accomplished. Don't be afraid to ask and keep asking until someone can make it happen for you. There's always a way! Keep pursuing! The University has SO many cool services available to you, use them while you can: It wasn't until junior year that I started realizing how many cool services/opportunities the university makes available to students at little to no charge. I'm not sure when the next time I'll have access to an expansive tech library, endless databases, a recording studio, a digital media center, a photo darkroom, or several high format printers will be - so I'm utilizing them now! Get on it and get your money's worth before you hit the downward slope of your college career! Getting to know a professor is worth your time: Everyone will tell you to swing by a professor's office hours, but I'll be straight with you, I've always been too much of a chicken to do that cold turkey. However, there is something valuable to be said about forming a relationship or at least getting to know your professor beyond the classroom. I'm about to be a senior and since I'm part of a relatively small department I know almost all of my professors now because I've had them before. It's made a world of difference to form these connections. I feel more engaged in class, more willing to interact, and feel more confident in getting feedback/help on my work. There's many ways to form a connection, try going up after class if your professors sticks around and say something nice or something you found interesting about the lecture you just sat through (ex: "I found that lecture about art in Rome simply fascinating today! I'm planning on studying abroad next year. Where could I find some of the works we discussed in class if I were to visit Italy?"). Also, try taking advantage of guest speakers/bonus opportunities/events going on within the department that your professor will most likely attend - just getting your face out there repeatedly counts! Also, if you find a professor you like and they teach more than one class, if it's within your power, try to get them again. Easy ways to form a connection without it getting awkward! Naps are life savers: I've taken way more naps in my college career than during my kindergarten nap time. Mastering the 15-45 minute break nap is essential for any successful, busy college student. No more than forty five minutes or else you'll be sluggish and your sleep schedule will slowly but consistently get off. I know from experience. P.S. - you'll become a napper even if you weren't one before! The Freshman 15 is NOT a myth: I gained the freshman ~30 and have yet to shed most of it. Sigh. Get on a routine eating schedule. That's the thing that killed me freshman year. I never ate at set times and sometimes would go long periods without eating and then binge eat from being overly hungry. Also, sometimes I'd eat more than once simply to accommodate different friend's schedules (because who wants to turn down an opportunity to be social with new college friends?). Practice portion control, pack healthy snack to take in your backpack, and try to get on a fairly consistent routine for eating! What are some college related things you know to be true from your experience? Let me know! All so true! I must say that I don't think Freshman 15 is an actual thing - I think it should be called 'when you move out of your parents' house 15' lol my freshman year I lived at my parents and I actual lost weight from all the stress - when I moved away the first time, i gained so much, my gosh it was shameful! These are wonderful. I could not agree more with the tip about Professors. I am a campus tour guide at my University, and I always tell my prospies to get to know their professors because it's so helpful! Professors love their students, especially if those students love their professors too. Thank you for these tips!